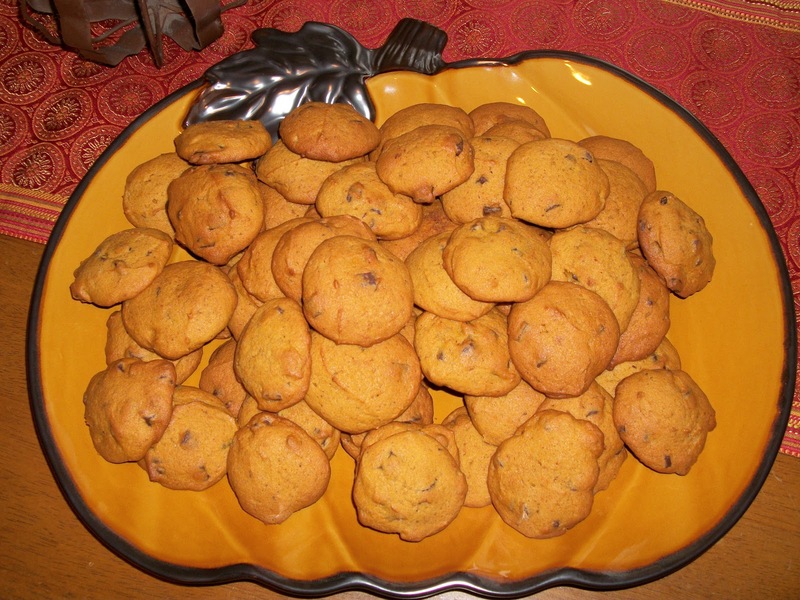 One of my very favorite fall recipes is Pumpkin Chocolate Chip Cookies. I used to get these from the bakery at Kroger’s, and then one day I decided to search foodnetwork.com to see if I could find a recipe that was similar. I swear these are just like the ones I got at Kroger’s. They are very moist and are more like a cake cookie. And although pumpkin and chocolate may not seem like they should go together, they really do complement each other very well. I highly suggest you try this recipe! 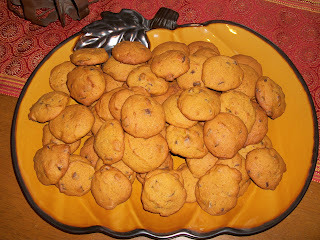 Heat the oven to 350 degrees F. Spray cookie sheets with nonstick spray or line them with parchment paper. Using a mixer, beat the butter until smooth. Beat in the white and brown sugars, a little at a time, until the mixture is light and fluffy. Beat in the eggs 1 at a time, then mix in the vanilla and pumpkin puree. In a large bowl, whisk together the flour, baking soda, salt, cinnamon, ginger, nutmeg, and cloves. Slowly beat the flour mixture into the batter in thirds. Stir in the chips. Scoop the cookie dough by heaping tablespoons onto the prepared cookie sheets and bake for 15 to 20 minutes, or until the cookies are browned around the edges. Remove the cookie sheets from the oven and let them rest for 2 minutes. Take the cookies off with a spatula and cool them on wire racks. Enjoy! Hey friend! I have these a try last night and absolutely LOVED. So, so tasty. I wasn't expecting them to be so cake-y but it was a welcome surprise. I also accidentally doubled all the spices, so they came out extra spicey, but it was still tasty. Thanks for the great tip and I'm hoping to try some of your other treats soon.